Watch Mercedes team-mates Lewis Hamilton and Nico Rosberg go wheel-to-wheel in the first two corners of the Japanese Grand Prix. After the race Rosberg, who dropped to fourth but eventually finished second, says he had to back out of the move to avoid a collision and that was where he lost the race. 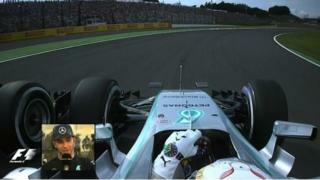 Hamilton, who won the race by nearly 19 seconds, defends the move and says "that's what racing is all about".